After being good all week and steering clear of coffee (learn why here), I decided since it’s Friday I could splurge a bit and treat myself to a small cappuccino. Dear Espresso,I love you. You make it so hard to say goodbye. Looks like my drink is having a bit of an identity crisis though! Hey Starbucks, Did You Hear the One About Obesity in America??? Let me preface this by saying you know I adore your delicious coffee, but (you knew the BUT was coming) what on earth is with this new “TRENTA” size??? At 7-ounces larger than a Venti, do you really think people need to be drinking 31-ounces of your iced coffee, iced tea or lemonade beverage offerings? Don’t you know we have an obesity epidemic in America? O yes, I know you were quick to point out to the media that unsweetened versions of your drinks will still have fewer than 90 calories, with sweetened versions under 230 calories. But I cry foul. According to your website, a 16oz. Caramel Macchiato (one of your many espresso drinks that I happen to know you offer in an iced version) boasts 240 calories and 7 grams of fat (damn, shouldn’t have looked!). So lets say I wanted an iced TRENTA caramel macchiato. Using some rough math, it looks like that sucker would have about 470-ish calories and 13-ish grams of fat. Just one example. And don’t act like people won’t A) Order those super-sweet, caramel/chocolate, whipped cream topped concoctions in an iced version or B) That you won’t serve those drinks in the biggest size possible and charge the biggest price possible. Listen Starbucks, I know it’s business and not personal. You need to make money and you know us American’s have a problem with self-control. I’m in marketing, I get it. But I’m also in health care, and I’m worried about the future health of our country. According to the CDC, American society has become ‘obesogenic,’ characterized by environments that promote increased food intake, nonhealthful foods, and physical inactivity. Increased food intake, huh. I’m pretty sure the TRENTA would fall into that category, thus adding to the health crisis in America rather than helping. If you need to boost your bottom line, don’t do it with this huge, tacky cup. Maybe instead you should stop opening stores across the street from one another. Not the smartest thing to be competing with yourself, now is it? I’m not one to tell you what to do, you’re a big company, you can think for yourself. Consider this just a little food for thought. Something to brew over in your mind. Drink it all in. Chew on this… (Ok, I’m done). And by holy, I mean you should actually pray to the divinity that is this hot chocolate. After waiting for inspiration for something to blog about today, it hit me. At 3:51 pm. In the form of an email from Starbucks. 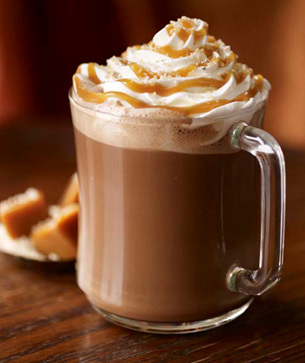 They’re bringing back their signature Salted Caramel Hot Chocolate!!!! I’ll give you a second to let that sink in. YES, it’s as amazing as it sounds. In fact, I think this may be the best combination of flavors created since a very wise person, many many moons ago, decided to put vanilla ice cream on warm apple pie. Note to self: build time into tomorrow’s commute for starbucks run. 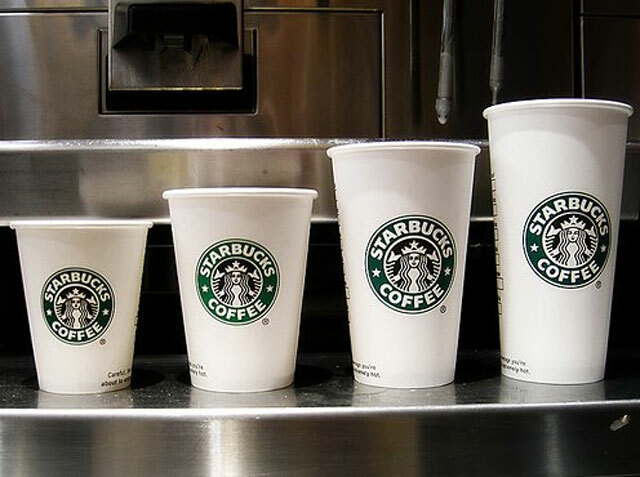 Nothing brightens my day like a lovely cup of Starbucks coffee. So you can imagine my disappointment in this mornings over-spiced pumpkin spice latte (aka the best part of Fall). I powered my way through my tall, and took my last sip only to get a mouthfull of globby spices – bleck!! Starbs, today you get a big thumbs down. And I know you have that little sign posted about “if we don’t make it right, we’ll make it again,” but I’m sorry that I’m on the go trying to get into work and don’t take my first sip until I get back into my car, and by that point it’s not worth the time, effort or dirty looks to ask for a re-brew. I still love you PSL.